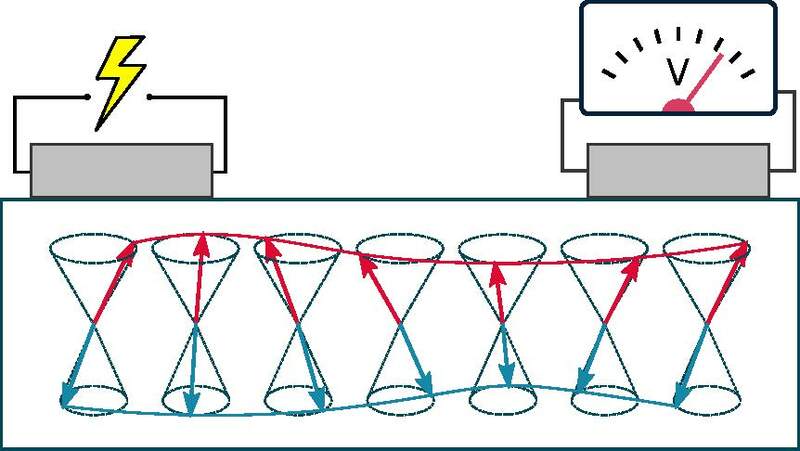 Scientists have succeeded in observing the first long-distance transfer of information in a magnetic group of materials known as antiferromagnets. An electrical current in a platinum wire (l.) creates a magnetic wave in the antiferromagnetic iron oxide (red and blue waves) to be measured as a voltage in a second platinum wire (r.). The arrows represent the antiferromagnetic order of the iron oxide. These materials make it possible to achieve computing speeds much faster than existing devices. Conventional devices using current technologies have the unwelcome side effect of getting hot and being limited in speed. This is slowing down the progress of information technology. The emerging field of magnon spintronics aims to use insulating magnets capable of carrying magnetic waves, known as magnons, to help solve these problems. Magnon waves are able to carry information without the disadvantage of the production of excess heat. Physicists at Johannes Gutenberg University Mainz (JGU) in Germany, in cooperation with theorists from Utrecht University in the Netherlands and the Center for Quantum Spintronics (QuSpin) at the Norwegian University of Science and Technology (NTNU) in Norway, demonstrated that antiferromagnetic iron oxide, which is the main component of rust, is a cheap and promising material to transport information with low excess heating at increased speeds. Their study has been published recently in the scientific journal Nature. By reducing the amount of heat produced, components can continue to become smaller alongside an increased information density. Antiferromagnets, the largest group of magnetic materials, have several crucial advantages over other commonly used magnetic components based on iron or nickel. For example, they are stable and unaffected by external magnetic fields, which is a key requirement for future data storage. Additionally, antiferromagnet-based devices can be potentially operated thousands of times faster than current technologies as their intrinsic dynamics are in the terahertz range, potentially exceeding a trillion operations per second. In their study, the researchers used platinum wires on top of the insulating iron oxide to allow an electric current to pass close by. This electric current leads to a transfer of energy from the platinum into the iron oxide, thereby creating magnons. The iron oxide was found to carry information over the large distances needed for computing devices. "This result demonstrates the suitability of antiferromagnets to replace currently used components," said Dr. Romain Lebrun from the JGU Institute of Physics. "Devices based on fast antiferromagnet insulators are now conceivable," he continued. https://trr173.spin-engineering.de – Transregional Collaborative Research Center (SFB/TRR) 173 "Spin+X – Spin in its collective environment"